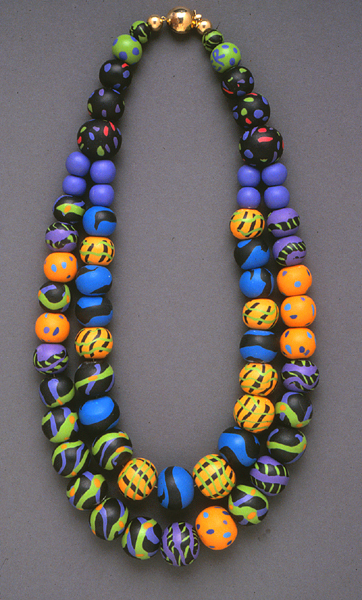 Are you hooked on Kathleen Dustin’s presentation about the work done by the early polymer bead makers? 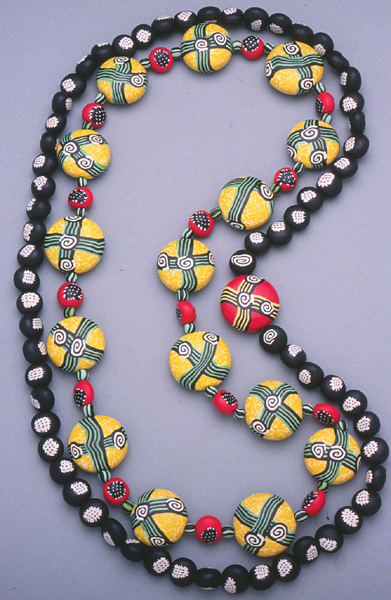 Then, you’ll want to see even more images by those pioneers. 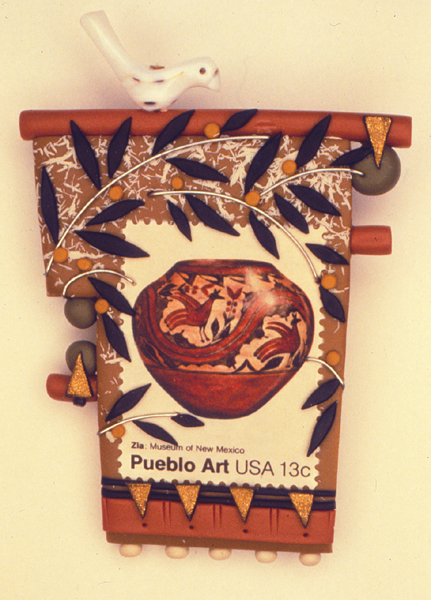 After each of Kathleen’s next few installments, I will provide you with an expanded view of those artists’ early work. 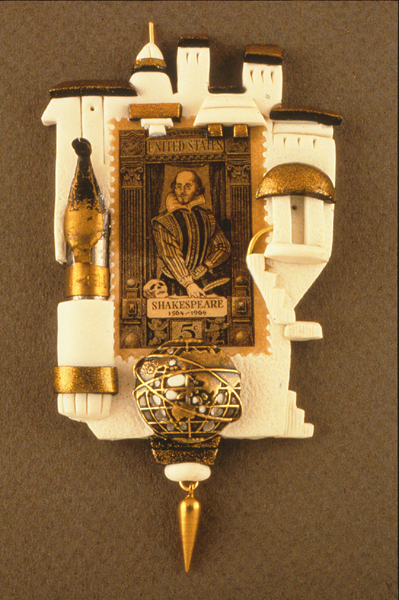 In the gallery that follows you can put Tory’s and Pier’s work into context over a decade. 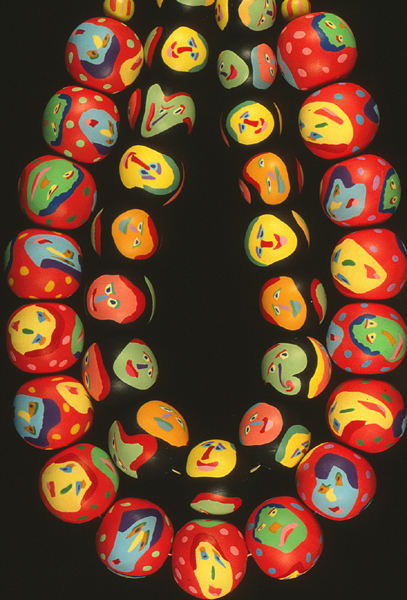 Click on each image to examine their pieces more closely. 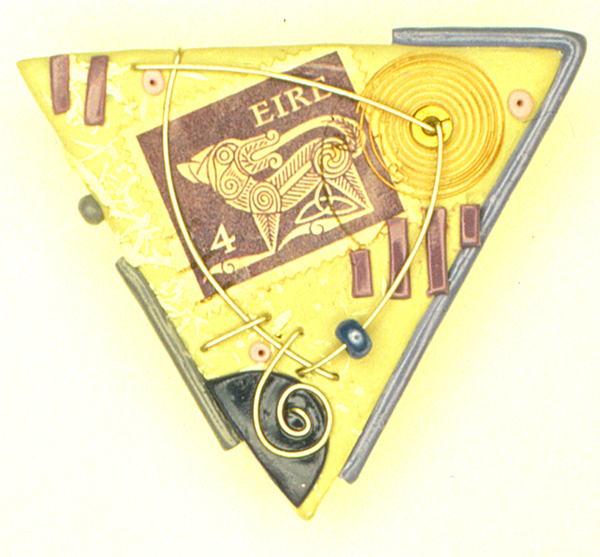 Victoria Hughes, Eire, Pin, 1985, 2″x2″x 1/4″ Notice the early use of a postage stamp in this pin. 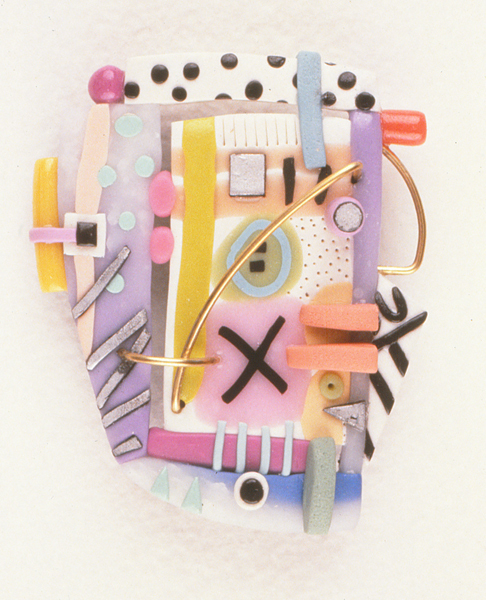 This will become the focus for an continuing and extensive series. 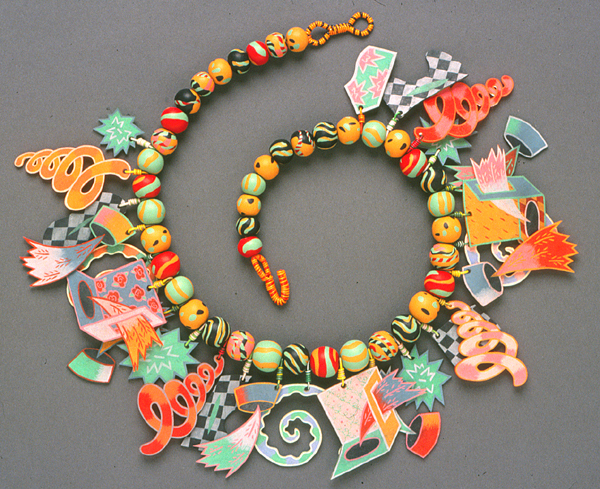 Victoria Hughes, Gifu, Necklace, 1987, 18″ long, plaques 1 1/4″ x 1″ Another early example of Victoria’s playful whimsical side. 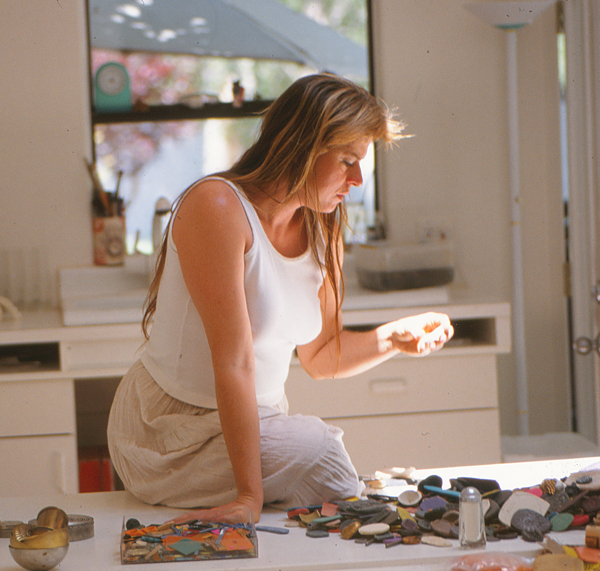 Pier Voulkos in her studio in 1994. 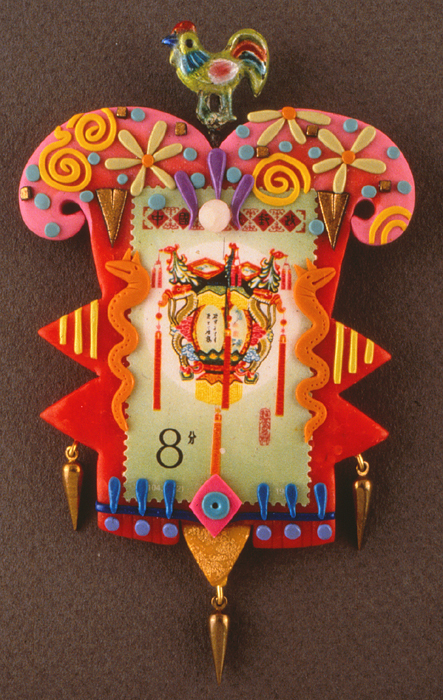 Pier has been extremely generous in sharing this image of her very first jury slide from 1978. It’s an important reality check for all practitioners in the medium, a reminder that we all start out as beginners. Apropos to the Synergy conference discussions on Craftsmanship, the next series of slides shows Pier’s increasing mastery of skills over a decade. 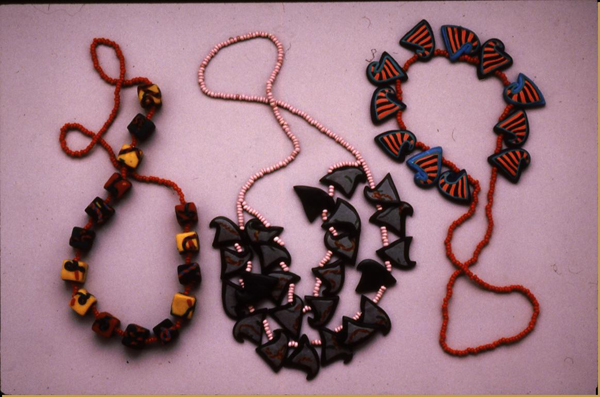 Pier Voulkos, Shrinky Dink Neck Pieces, 1985 Charms made of shrink plastic with polymer spacer beads. 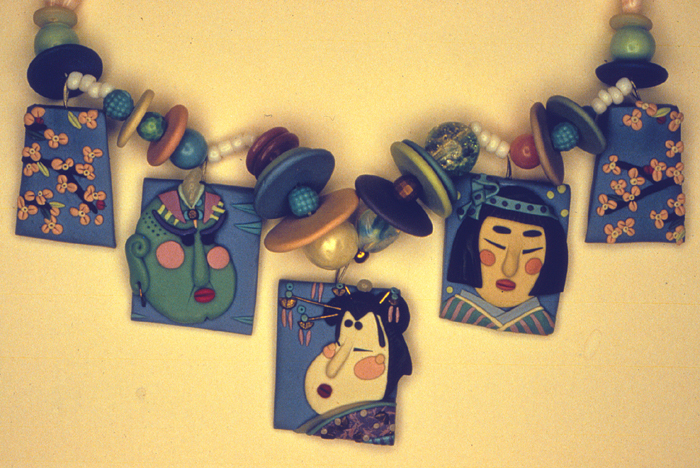 Notice Pier’s early use of telephone wire to hang her charms. 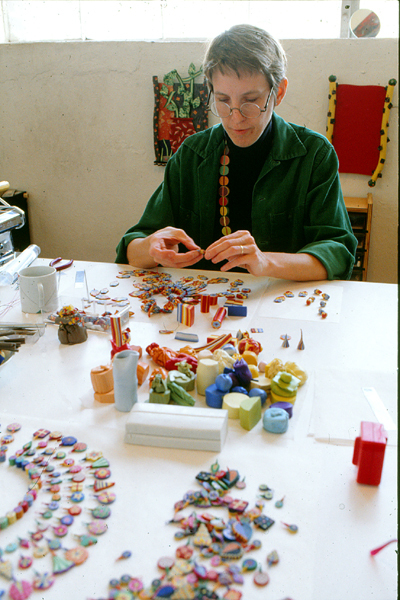 She goes on to use this material in more complex ways as her work continues to mature. 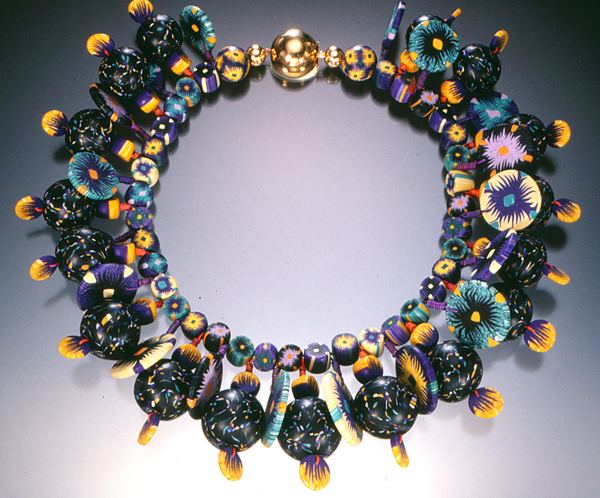 Pier Voulkos, sliced caned necklace, circa 1990 This necklace appeared in Nan Roche’s book, The New Clay. 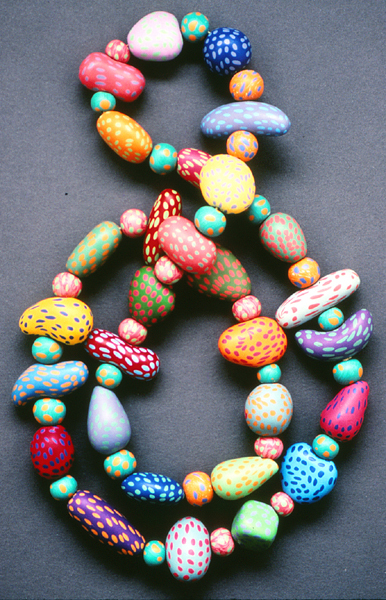 Notice that Pier has begun to use telephone wire both as a decorative element and to create more complex necklace structures.